A scarce first edition example of S. A. Mitchell and H. N Burrough's 1846 map of Iowa. This map was prepared by H.N. Burroughs as plate no. 16 in the 1846 edition of Mitchell's New General Atlas. The map covers all of modern day Iowa though county platting has been limited to the southeastern quadrants. The remainder of the state is devoted primarily to the Sioux and Sac and Fox American Indian Nations. 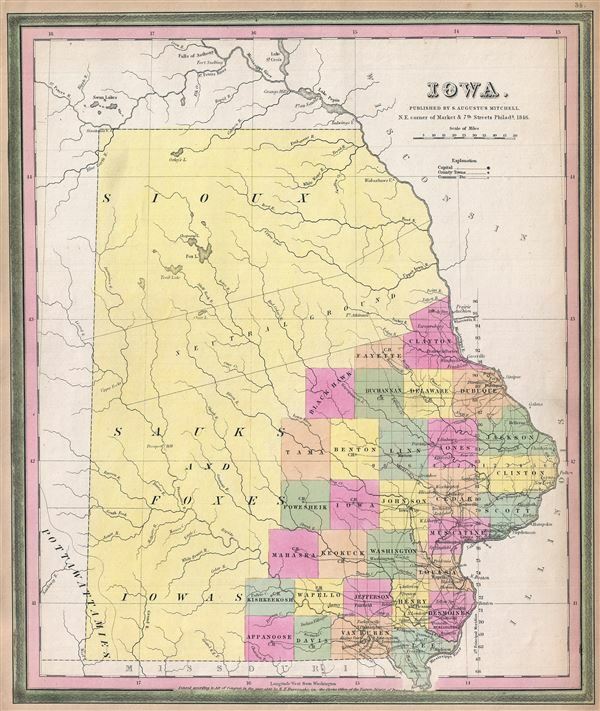 Iowa was admitted to the Union on December 28 of 1846, the same year this map was issued. Around the same time the Sac and Fox largely withdrew from Iowa - a legacy of the 1832 Black Hawk War. The Sioux meanwhile ranged far and wide in northern Iowa, including deep into Sac and Fox territory. The U.S. Government subsequently established a Neutral Ground roughly 40 miles wide and enforced from Fort Atkinson, shown here, as a buffer zone between the two tribes. This map was drawn by H. N Burroughs for the 1846 first edition of Mitchell's New Universal Atlas. H. N. Burroughs (fl. c. 1835 - c. 1860) was an engraver based in Pennsylvania and active in the early 19th century. Burroughs is an extremely elusive figure who work appears almost exclusively in conjunction with that of Henry Schenk Tanner and Samuel Augustus Mitchell (the elder). His name appears on the 1846 copyrights of many of Mitchell's earliest and most important atlas and pocket maps. Following 1846, Burroughs seems to have retired from cartography or changed careers. There are records of one H. N. Burroughs who owned a Pennsylvania coal mining company, and another who was president of a New York Bank. Whether or not these are the same individual is unknown. Mitchell, S., A New Universal Atlas Containing Maps of the various Empires, Kingdoms, States and Republics Of The World, 1846. Very good. Minor overall toning. Chip upper left margin not intruding on printed area. Blank on verso. Rumsey 0537.035. Philips (Atlases) 6103-35.